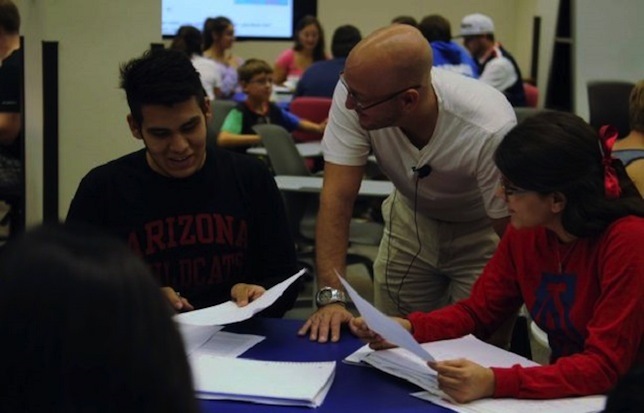 The University of Arizona is preparing for a massive initiative to implement active learning in several courses next fall. With a grant from the Association of American Universities, the Tucson, AZ campus is overhauling several classroom spaces to accommodate active learning in environments that will vary in size once the fall semester begins. Once construction that begins in May is completed, a classroom space in the Science-Engineering Library will have a capacity for 260 students while another in the Biological Sciences West building will accommodate 112 and two more in the Integrated Learning Center will provide room for 60 students each. A fifth space is being scouted as well. "We want a variety of sizes, as well as a variety of locations across campus," said Jane Hunter, an associate professor of practice with the university's Office of Instruction and Assessment. "By distributing these rooms around campus, we like to believe that people will see them and say, 'I'd like to do that.'" All of the classroom spaces will move from being the kinds of rooms in which a lecturer stands at the front of the room to ones in which students will sit at tables of, at the most, six in an effort to enhance engagement. Each will also be supplied with banks of computer monitors, tabletop and A-frame whiteboards and other kinds of "high-touch" technology. "I was ready for a space like this before it existed," said Susan Jorstad, who will teach an introductory course in molecular and cellular biology in one of the spaces in the fall. "I've been doing active-learning things all along, but in a space that's not very conducive to it." A faculty learning committee is preparing two workshops to be held during the summer for instructors who will use the active learning spaces in the fall and a webinar featuring the UA project will be offered May 5. "These rooms are like a catalyst for those who have been thinking about modifying their teaching strategies," said Hunter. "The innovators, the early adopters, they want to be in on this."